I can&apos;t believe it&apos;s almost Valentine&apos;s Day already! Wasn&apos;t it just Christmas? And I thought that fall went fast! I&apos;m guessing spring is going to be here in no time flat...and while I know that most of you aren&apos;t so much enjoying the frigid cold that&apos;s enveloping us here in the USA, we might as well have fun with the last winter holiday. I&apos;ve always loved Valentine&apos;s Day myself. I&apos;m not necessarily into huge, expensive gestures, but I&apos;m all about any day that celebrates romance. And in my house, we usually celebrate heart day with a romantic dinner, snuggles on the couch and a rented flick...after the kiddos go to bed of course. But that doesn&apos;t mean I don&apos;t think about going out. It would be fun to get all dolled up for my honey and go out on a special date. Truthfully though, we love our cozy Valentine&apos;s Day so much in each year, this year probably won&apos;t be any different. Haha! I can live vicariously through those of you who have hot plans right? If you&apos;re wondering what to wear on Valentine&apos;s Day, I&apos;ve got you covered! Whether you&apos;re staying in like moi or have something more exciting on the agenda, you should be able to find some Valentine&apos;s Day fashion inspiration here! If you&apos;re riding the couch on Valentine&apos;s Day, a cute tee might be right up your alley...but if not...A fabulous frock in a heart day ready hue would be just the ticket! Don&apos;t forget to dress up your tresses on Valentine&apos;s Day! In addition to a little hair candy, you might want to try spritzing a yummy smelling fragrance on them. That&apos;s a little something I learned from my grandmother. And if you&apos;re loving the Andrea&apos;s Beau pieces as much as I am, you&apos;re in luck. They&apos;re offering FREE shipping with the discount code momtrends which is good through February 1, 2013. And you can connect with them on Pinterest and Twitter. 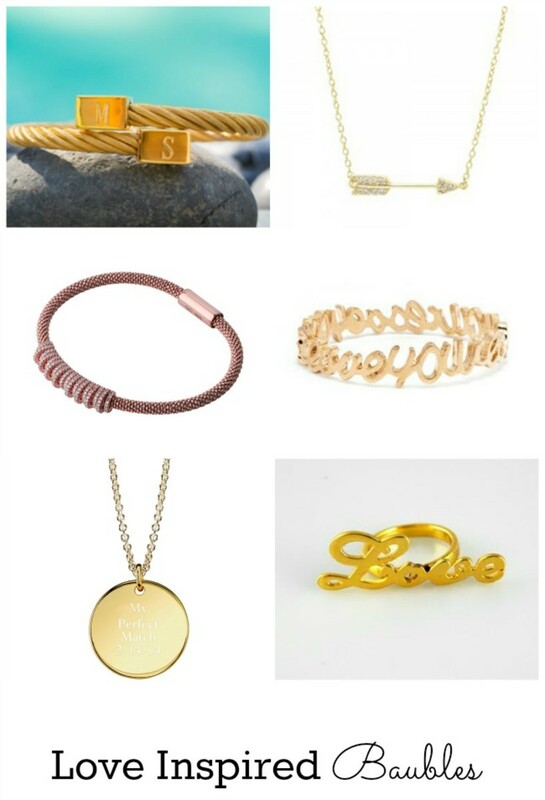 Head out on the town showing the world how much you love your honey by rockin&apos; some amour inspired jewelry! I&apos;m crushin&apos; pretty hard on the BaubleBar Love You bangle myself. I could totally rock that while I&apos;m sippin&apos; wine in my jammies right? Haha! And if you&apos;d like to give your significant other some incentive to pick you up a bauble or two...Links of London is offering a complementary white sapphire heart charm with the purchase of any Mini Sweetie bracelet from 1/29/13-1/14/13. Happy almost Valentine&apos;s Day lovelies!